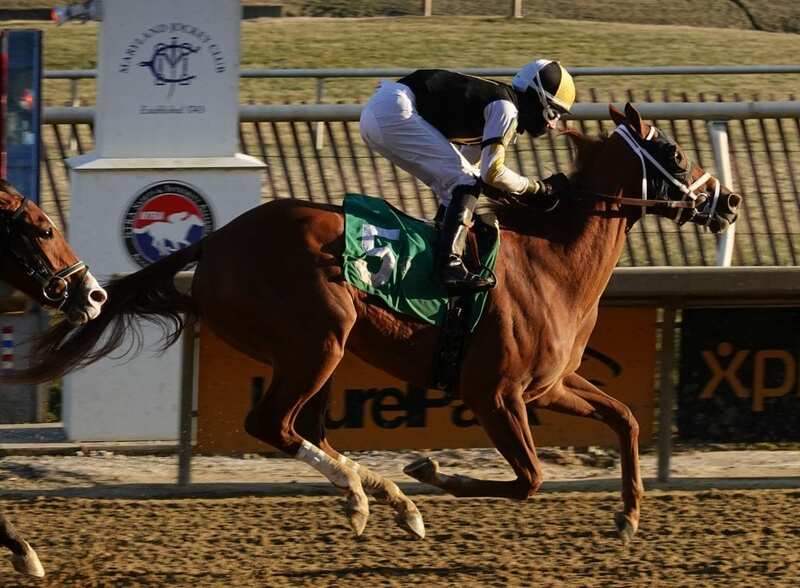 Two Dozen Roses won an allowance race at Laurel Park on January 26. Photo by Laurie Asseo. Trevor McCarthy won three of the first four races on the Saturday afternoon 10-race program. Those victories give him 18 for the winter meeting — five more than any other rider. His average winner at the meet has paid $6.87, and he’s one of just three riders — Victor Carrasco and Jorge Vargas, Jr. being the others — to have 10 or more wins to date. One of McCarthy’s three winners came on a crafty ride aboard the popular local horse John Jones, who took a third-level allowance/optional claimer in race three. John Jones pressed the early pace outside of Moe Trouble, dropped a couple of lengths back in the lane, came down inside and rallied to get up by a nose. It was John Jones’s first win since winning the Jennings in December 2017 and 10th overall. He paid $7.20. The day’s other allowance went to Two Dozen Roses (pictured above) and rider Jorge Vargas, Jr. That duo made a spirited rally between horses from fourth with a furlong to go to win by a length. Trained by Todd Pletcher, Two Dozen Roses won for the second time in six starts and returned $7.60. Maidens no more: Starting Tour (trained by Gary Capuano and ridden by Johan Rosado), Field Letters (Justin Nixon/Sheldon Russell), and Trion Wings (Dorothy Worton/Rosario Montanez) all earned their diplomas today. With his win in the fifth, Runabout (Wayne Potts/Montanez) became the fourth horse to win twice at the current Laurel meeting; no horse has won more than twice. Among the humans getting their first wins at the meet were trainers Dorothy Worton and Justin Nixon and rider Sheldon Russell.